Corinth battlefield saw many dead and wounded between April 29th to May 30th, 1862 in one of the vital battles of the American civil war. The area of Corinth hosted a very important crossroads between the Mobile and Ohio track, and the Memphis and Charleston track. Whoever controlled this section of the railroad would be able to troops and supplies across great distances, and so became a very important strategic point. The first battle to happen here took close to a month, when the Union forces led by Ulysses S. Grant attacked the confederate held town starting several miles away. After each push the Union troops dug in and secured a new foot hold, taking 3 weeks to move 5 miles in this way. When they were in position to lay siege to the town, the Confederate commander managed to save his men with well played hoax. General P. G. T. Beauregard, commander of the confederate forces in the town gave a few of his men 3 days of rations and told them to prepare for an attack after reinforcements arrive. Since moral was very low a few of these men fled to the Union troops and told them this information. The union troops dug in and prepared for an attack on their trenches. Mean while the Confederates used one of the train lines to load up tons of supplies, along with heavy artillery and all of their men, covered by cheers from the troops when a new evacuation train arrived, as if it were full of reinforcements. Campfire and drummers played all night, and fake guns were set up in place of the ones they evacuated. The next morning the Union forces attacked the town to find it completely empty, not a single Confederate troop remained. The Union troops held onto the town until the end of the war, though the Confederates did try to take it back in a very unsuccessful attack in October of 1862, which saw thousands more dead in the attempt. 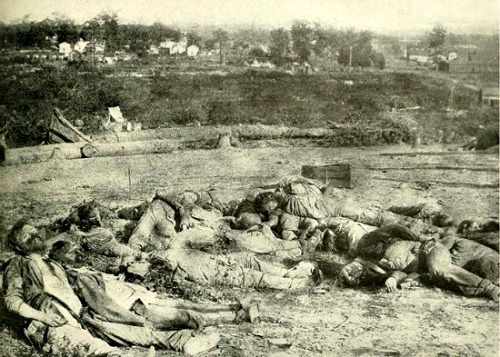 The photo above if a picture of some dead Confederate troops at one of the artillery positions during the second battle of Corinth. Today the area has several memorial sites and points of interest in relation to the battle, though much of the area which was actually fought in has now been covered by buildings. The first wave of losses at Corinth battlefield saw only a few hundred dead, since it was mostly siege fighting which meant the occasional artillery shell might find its mark, but no mass fighting took place. 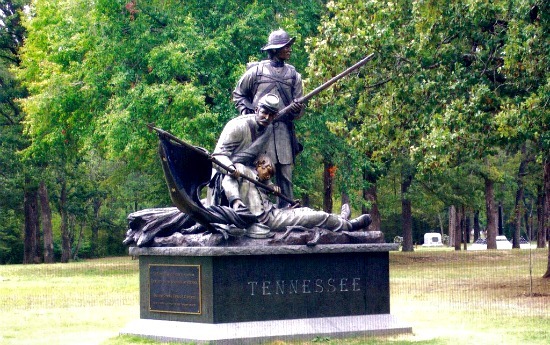 It was the second battle when the Confederates tried to retake the town which saw the most deaths. The attacking commander decided to go for one huge direct assault, instead of laying siege to the town and on the day of the battle he lost an estimated 4000 men, with Union losses being less than 1000. After the battle the confederates suffered further defeat at the hands of disease's such as dysentery, which claimed hundreds more lives. As for actual paranormal activity its pretty much the same as at many other battle fields. There are various stories about sightings of the men who fought here, with claims ranging from seeing full battle lines to a single dead soldier on the ground. There are a few areas of the battlefield which seem to be more haunted than others, such as Battery Robinette, which is were the picture above was taken. Electrical equipment in this area seems to play up quite often, which is most commonly unexplainable battery drains, with the charge to return upon leaving the area.